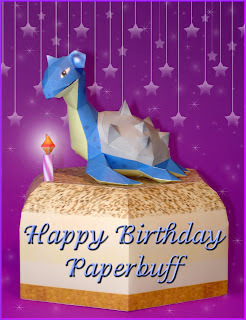 Paperpokés - Pokémon Papercraft: Happy Birthday, Paperbuff! "A friend is one who sees through you and still enjoys the view!" And happy birthday to Aidan too. that is a cool cake. are those cakes available for download someplace? We are planning to release templates for all the birthday cakes. Not yet sure when but watch out for it. WHAAAT?!?!? PAPERBUFF IS A GIRL??? The word "buff" in the name thew me off. And there is your etymology of the name Paperbuff.